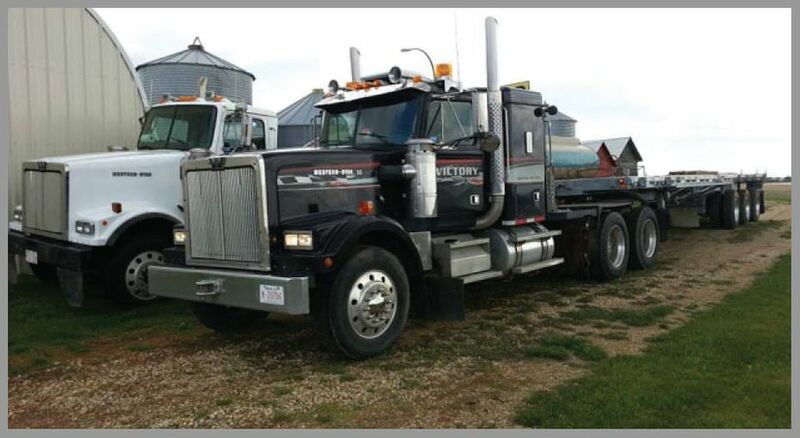 Based in Camrose, Victory Oilfield Services Inc. is a Certificate of Recognition (COR™)-certified transport company with an excellent safety record. Locally owned and operated since 2005, we specialize in speedy deliveries in the growing oilfield energy sector. We began with a ¾ ton truck but we’ve grown over the years to reliably haul and delivera vast array of oilfield equipment all over Western Canada. We have specialized sealed equipment which allows us to provide environmentally-friendly hauling. Being COR™ and ISNetworld certified, Victory Oilfield Services Inc. ensures safe, timely deliveries throughout Western Canada. Our fleet includes a 30-ton winch tractor, 2-ton trucks with a 7,000lb picker, a 1-ton deck truck, a 53’ tridem air ride hi-boy and 30-40’ deck trailers. Our professional, experienced drivers ensure the utmost care while hauling your loads. You can count on us to get your equipment from Point A to Point B, on schedule and at a competitive rate. Please do not hesitate to contact Victory Oilfield Services Inc. about your delivery requests. We’ll find a customized hauling solution for your needs. You may call us at 780-887-9007 or email us at voshotshot@gmail.com to request a quote and/or to schedule our services. We’re available 24/7 – give us a call!